I am very pleased with this book (“Occupy Spirituality“). It is a conversation between a young activist and an old one. 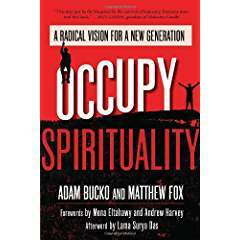 Adam Bucko (late 30’s, raised a Catholic in Poland, helps run a ministry to homeless youth in New York City) and Matthew Fox (late 70’s, a thinker, educator, author, and former Dominican, was evicted from “The Church” by the Vatican – in effect for talking too much, sorta like Socrates. He then became an Episcopal priest). This is the elder’s job: to assist the young in their vocations to lead. It feels like a gentle wind blowing across our faces … in the last few years … my work has become about prayer. Young people are carrying a huge burden, with the ecosystem collapsing … with the job market not delivering … with education costs out of control … with religion being silly a great deal of the time. #SpeakeasyOccupySpirituality Adam Bucko. Matthew Fox.